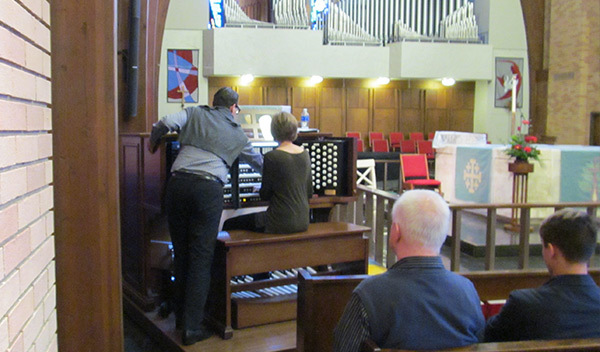 On Saturday, October 29, at Faith Lutheran Church in Fairlawn, members of the Akron Chapter of the American Guild of Organists met for a morning exploring the possibilities for improvising at the organ for the ‘average’ church musician. The session was led by Philadelphia organist Sandor Kadar, (‘Shandor Kuh-dahr’) a Hungarian-born musician, who has also studied at the famous Westminster Choir College. 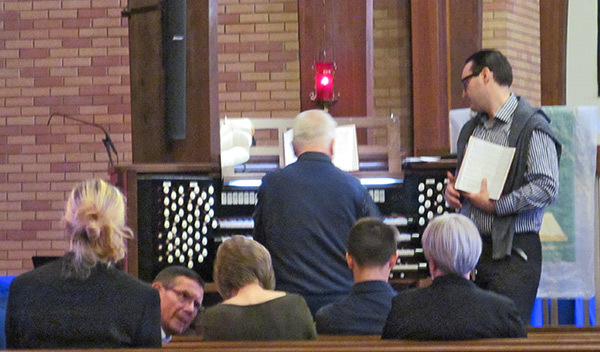 Mr. Kadar gained considerable notice in 2015 when he was the organist for two public papal masses, for the visit of Pope Francis I to the city of Philadelphia, which included music performed with the Philadelphia Orchestra. 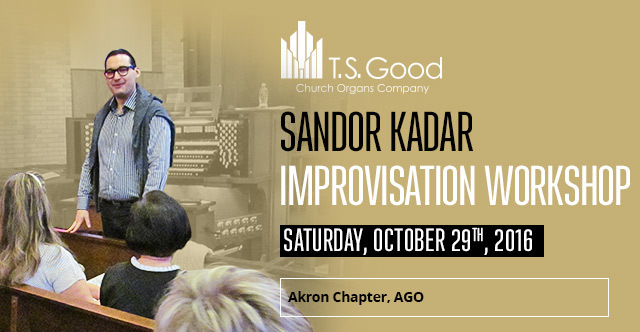 He is also recognized for his unique approach to teaching organ improvisation, and, of course, Mr. Kadar is a master improvisor himself. Sandor had requested that each participant come prepared to play a hymn that included an introduction, harmonization and variation, as well as a coda. When the participants displayed their usual hesitance to perform for one another under such circumstances, he proceeded to begin to play a free improvisation, and then ‘made’ each participant add to it, ‘musical chairs’ style. This proved to be a very effective ice breaker and greatly helped everyone put their reticence aside. In fact, the resulting impromptu fellowship turned out to be a highlight of the morning. The rest of the time was spent with each player being requested to find ways to ornament a hymn melody (add passing tones, change the order of the notes slightly, etc.) effectively add ostinato accompaniment figures (both in the left hand and in the pedal), and any other way to stretch and extend the form of the hymn. He seemed to extract endless possibilities from each player. Sandor’s manner was sympathetic and his European accent most appealing. He seemed to know how to encourage each player and make everyone in attendance very much at ease. It was quite a successful and pleasant morning. Of course, he also improvised a hymn for the audience. Sandor and the choir, directed by Prof. Jordan Saul, received a standing ovation from the enthusiastic audience for their efforts.